These long-life, high-reliability cable test reels are intended for professional R2 and earth-bond continuity-testing and are compatible with a wide variety of test meter brands. These can be used as an extension for all types of insulation and multifunction testers fitted with 4mm terminations and is an essential accessory. Ideal for testing ceiling roses, light fittings and distant circuits. The convenient hand wheel arrangement makes rolling up the cable quick and easy. The extension lead is terminated with a shielded 4mm plug and push-on crocodile clip meeting the requirements of BS ENIEC 61010-1 and rated 10A, 1000V CAT II, 600V CAT III. Manufactured by Cliff™, in our UK factory, the reels are available with standard lengths of 30m and 50m of double-insulated cable which provides visual indication of any damage by revealing the white inner sheath in the event of misuse or cracking. Cables are available rated to 1KV (PVC), 5KV and 12KV (silicone) and may be supplied in black, red, green, blue, brown and yellow. 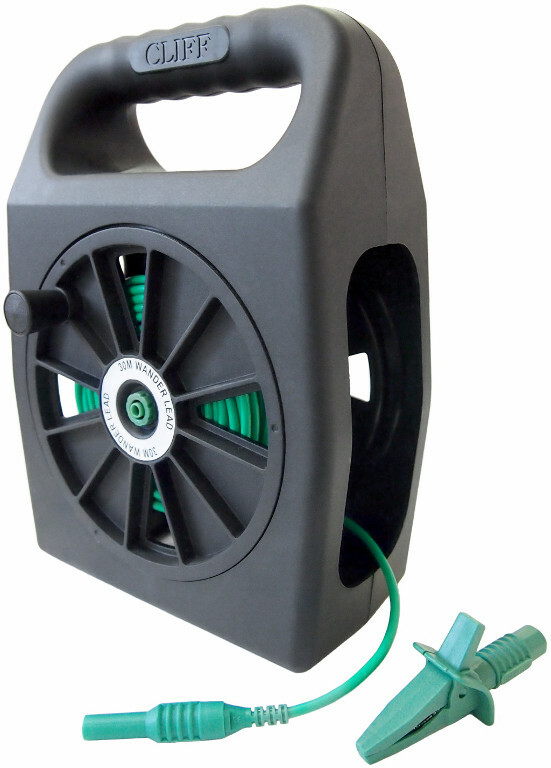 The rugged, proprietary cable reel housing provides OEMs with the ability to have their brand logo inserted into the handle, subject to a minimum order quantity. The standard housing colour color is black with other colours colors available to special order. All test lead sets and components are manufactured in our own ISO 9001 certified factories. They exceed all relevant safety specifications such as BS ENIEC 61010-1, are CE marked and RoHS compliant. Please see the PDF data sheet: Miscellaneous Test Leads (opens in a new window). CIH299430 Earth continuity extension reel to 4mm plug. CIH299450 Earth continuity extension reel to 4mm plug.